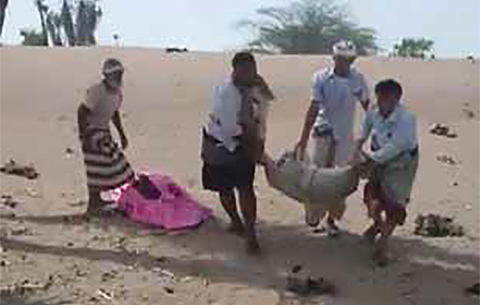 UNITED NATIONS: Two Saudi-led coalition air strikes in Yemen have killed at least 26 children, UN officials said yesterday, renewing calls for an independent investigation of attacks targeting civilians in the three-year war. At least 22 children and four women died in an attack Thursday while fleeing fighting in the Al-Durayhimi district, south of the rebel-held city of Hodeida, UN aid chief Mark Lowcock said. In addition to that strike, four other children were killed in a separate air strike in Al-Durayhimi, also on Thursday. “This is the second time in two weeks that an air strike by the Saudi-led coalition has resulted in dozens of civilian casualties,” Lowcock, the undersecretary-general for humanitarian affairs, said in a statement. A coalition attack on a bus in the northern rebel stronghold of Saada on August 9 killed 40 children, prompting UN Secretary-General Antonio Guterres to call for an independent investigation. Lowcock renewed the UN appeal for “an impartial, independent and prompt investigation” and said “those with influence” over the warring sides must ensure that civilians are protected. The rebel-run Saba news agency said the air strike on Thursday hit a bus and a house but the United Arab Emirates, a key partner in the coalition, blamed the Houthi rebels for the attack. Al-Durayhimi lies some 12 miles (20 kilometers) south of Hodeida, and has seen two weeks of fighting between the rebels and pro-government forces backed by the UAE. “I had hoped that the outrage that followed the Saada attack in Yemen two weeks ago would be a turning point in the conflict. Yesterday’s reported attacks in Al-Durayhimi, killing 26 children, indicate that it was not,” said Henrietta Fore, the director of the UN children’s agency UNICEF. Fore urged the warring sides, their foreign backers and the Security Council to “take action and end this conflict once and for all.” After widespread condemnation of the August 9 bus attack, the coalition announced that it was opening an investigation, but rights groups insist any probe should be impartial. In a 90-page report, Human Rights Watch said the coalition had failed to properly investigate war crimes allegations stemming from attacks on civilian targets. HRW’s Middle East director Sarah Leah Whitson said the coalition’s investigators “were doing little more than covering up war crimes.” The European Union urged Yemen’s warring sides to “prioritize the protection of civilians in all instances” following the attacks in Al-Durayhimi and stressed the need to end the war, according a statement from the EU foreign affairs spokesperson. UN-brokered talks between Yemen’s government and the Houthis are to open in Geneva on September 6 – a first step toward resuming peace negotiations that broke down two years ago. The Security Council has called for a “credible” investigation of the bus attack in Yemen, but did not demand an independent probe.